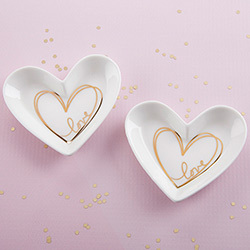 If you're looking for something pretty to use to display your rings, jewelry, coins or other trinkets, choose Kate Aspen's Heart Shaped Trinket Dish. This decorative tray will look just darling on your bedside table, or anywhere else. 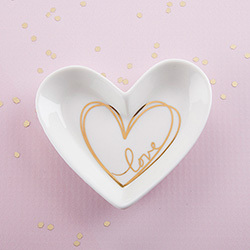 White ceramic heart shaped trinket dish features gold foil heart print. Trinket dish is hand wash only. 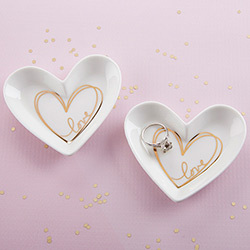 Trinket dish measures 3.25" w x 2.8" h x 0.5" d.
Packaged product measures 3.25" w x 3.25" h x 0.7" d.